Pulmonaria is the tremendous beautiful evergreen plant of the family of Boraginaceae which arose in Eurasia. Huge decorative multi-colored and spotty leaves of a pulmonaria simply bewitch – from them it is impossible to tear off a look! The Russian name is a plant received because is an excellent melliferous herb. Flowers of a pulmonaria contain a huge amount of sweet nectar which attracts bees. 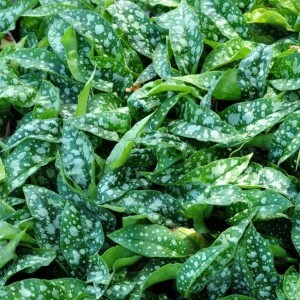 Sometimes pulmonaria is used and in traditional medicine as a resolvent. And in Great Britain pulmonaria is grown up as a salad plant – in food use leaves of this perennial.